Shrimp Tacos with Grilled Poblano Salsa – the secret to these shrimp tacos is in the salsa! Fresh corn, cherry tomatoes, and poblano pepper are grilled, then tossed with creamy diced avocado, cilantro and lime juice for unforgettable shrimp tacos! Shrimp tacos are always a favorite, but especially during the hot summer months. If you are a shrimp taco fan, you are going to love these shrimp tacos with grilled poblano salsa. They are SO good! The colorful and vibrant salsa is a MUST! This easy shrimp taco recipe is perfect for any summer BBQ. You can make the salsa in advance so you are ready to go when it is grill time. This is a great recipe for entertaining or for an easy weeknight dinner. You can’t go wrong! You can always use one more barbecue recipe and this is definitely it! 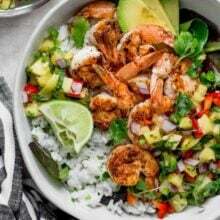 I’ve made these shrimp tacos countless times this past summer and it’s my go-to recipe for when I need a great healthy meal. The real kicker in the shrimp tacos isn’t the shrimp though—it’s the salsa! By grilling all of the ingredients in the salsa, it really ramps up the flavor big time. 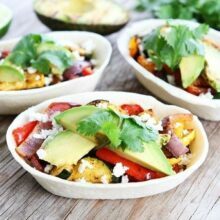 In it, fresh corn, cherry tomatoes, and poblano pepper are grilled and tossed with creamy diced avocado, cilantro, and lime juice. You can serve the tacos in corn tortillas or flour tortillas, but we prefer corn tortillas. 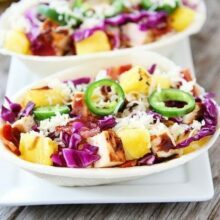 You could also serve the shrimp and salsa over a salad and go the taco salad route! There are lots of ways to enjoy the delicious shrimp and salsa! I promise this shrimp taco recipe with grilled poblano salsa will be a favorite for years to come! 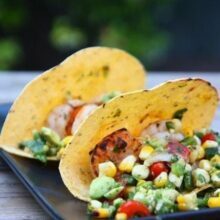 Thanks Jenna for guest posting these yummy grilled shrimp tacos! Make sure you check out her fabulous blog, Eat, Live, Run! These easy grilled shrimp tacos with poblano salsa are a summer favorite! Heat your grill up to medium high. Brush corn, green onions and poblano pepper with olive oil and place on grill. You want everything to have a nice char to it—the pepper should be black and the corn and onion should be charred. This will take about five minutes, flipping occasionally with tongs. When done, remove veggies from grill and let cool on a plate. When cool, peel the now black skin off the pepper, remove the seeds and chop into small dice. 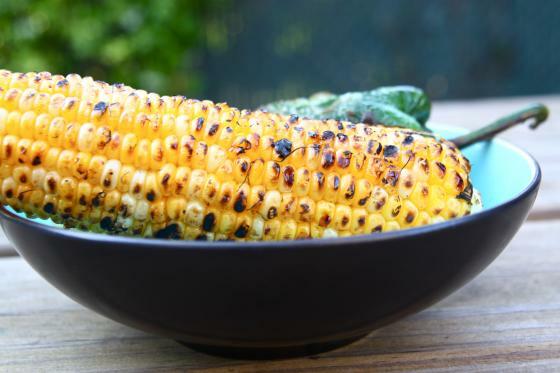 Run your knife down the corn to remove the kernels from the cob and place into a bowl with the pepper. Chop onion and place into bowl as well. Add chopped avocado, cherry tomatoes and cilantro to the bowl and add lime juice and salt. 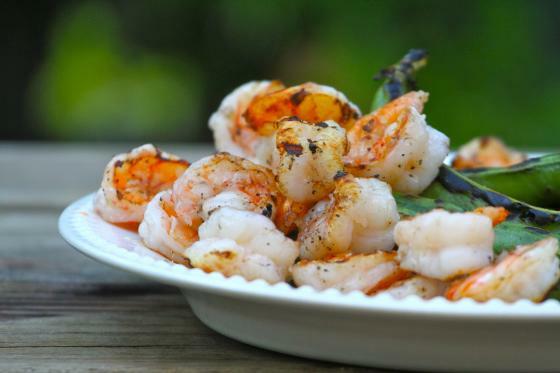 Season to taste and set aside while you prepare the shrimp. Grill the shrimp for only a few minutes until pink. Be careful because shrimp cook extremely quickly! When done, place into tortillas, top with salsa and eat immediately. These sound like the perfect way to celebrate the last few days before it actually get’s really cold! That corn looks absolutely perfect! AND HELLO, LOVER SHRIMP TACOS THAT I MIGHT NEED TO GO TO SECOND BASE WITH. This looks awesome. I don’t know which looks better to me, the shrimp or the salsa! My husband will love me for these. Grilled shrimp is his favorite. The salsa sounds divine! Oh, my. Those tacos look amazing. 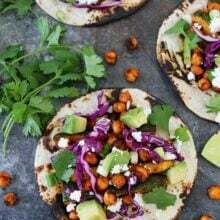 Definitely adding them to the menu for one of our Tuesday Taco nights this month! That’s the sound of me face planting. I heart shrimp tacos forever and ever amen. These shrimp tacos are a must do for me, they look extraordinary delicious!! Maria, thanks for having this guest post, wish the best for you and your new baby pea. Wow,that looks great! I need to make this! I love taco’s! I never eat enough of them!! These tacos look great. I love any kind of taco! These shrimp tacos sound yummy. I especially like the sound of a pablano salsa. I could see using this with many dishes! 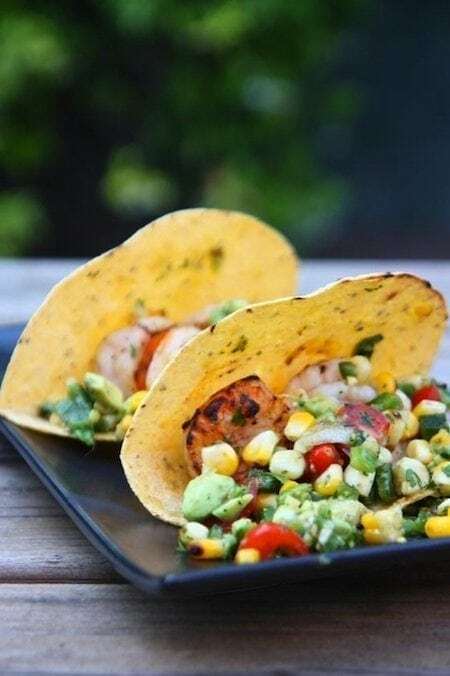 Hmm I’ve never tried shrimp tacos, but these look really light and delicious! Thanks for stopping in and welcome! Jenna, love the combination of flavors in this….and the simplicity of it too. Sounds easy, delicious and healthy too. I am a huge fan of fish tacos, so there is no doubt that I will LOVE these shrimp tacos! Shrimp, fish, chicken… anything wrapped in a crunchy tortilla works for me!! these look so delicious, I love shrimp and eat tacos daily 🙂 can’t wait to try this poblano salsa. Looks interesting. I like tacos and I like shrimps. This must be realy good. I love this recipe! Fresh and simple. Thank you! I can’t believe I missed this. These sound amazing. Adding these ingredients to the grocery list! Can’t wait to make them! Just made these for dinner! Thanks for the delicious recipe! Huge hit with my 2 picky eaters. And it was fast to make on this busy friday!! I made these today and they were fantastic! I didn’t use the grill, but the broiler, and it still had a nice smoky taste. I charred red pepper, which I thought tasted great in the mix. I also used a shrimp/salmon combo. My only thought is there was less heat than I wanted, so I will use 2 poblano peppers next time. I cook 5 days a week for a client and this recipe gets my approval.